Ramco Cements Ltd, one of the key cement producers in south India, recently announced both greenfield and brownfield expansions. The company is setting up a cement plant of 3.15 million tonnes per annum (mtpa) capacity in Kurnool district of Andhra Pradesh. It is also expanding capacities of its clinker unit and waste heat recovery system. The cement maker would spend ₹ 3,430 crore of its own profits for these expansions. Once the expansion is completed, the production capacity of Ramco Cements will increase to 20mtpa in the two years by the end of 2020. The expansion will also help Ramco Cements increase its presence in Andhra Pradesh and Telangana. The company’s capacity share across these markets is estimated to increase from 22% in financial year (FY) 2016 to 37% in FY21, according to brokerage house Nirmal Bang Ltd. The move bodes well for the company but signals further pressure on prices for the cement sector. Some demand traction is visible in Andhra Pradesh, Telangana, and Tamil Nadu especially after the sand crisis has eased, analysts said. Still, growth in demand is not sufficient to match increasing supply. Surplus supply will likely remain at the highest level in south India compared to other regions at 74 million tonnes in fiscal year 2021, according to estimates by Reliance Securities Ltd. This is weighing on cement prices. Cement prices across India continue to be on a weak footing and the southern region seems to be the most impacted by this demand-supply imbalance. “All India cement prices declined by ₹ 3/bag month-on-month to ₹ 317/bag in December 2018—we note that this is the sixth consecutive month of price decline with prices falling by ₹ 15/bag since July 2018," reported the monthly dealer survey by Kotak Institutional Equities. One cement bag weighs 50kg. 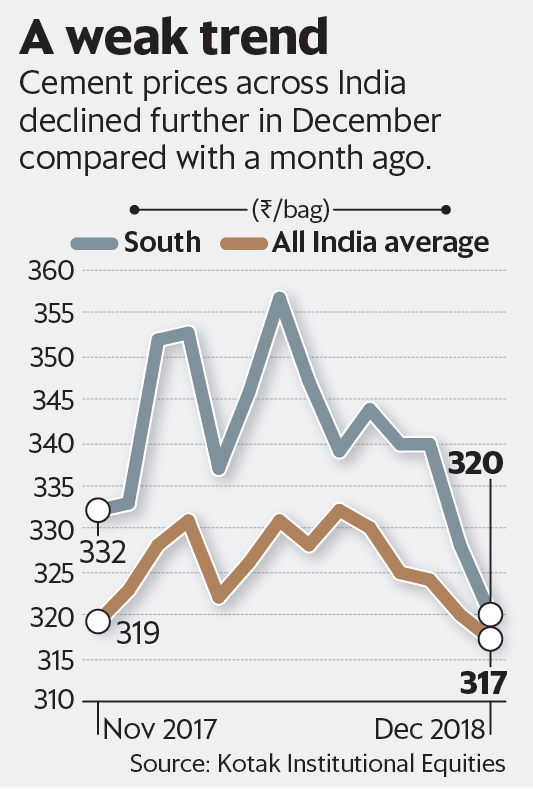 Regionwise, on an average, cement prices declined by ₹ 7/bag in the south to ₹ 320/bag in December. “Prices declined by ₹ 5-10/bag in Karnataka, Andhra Pradesh and Tamil Nadu. We note that cement prices in the south have declined by close to ₹ 30/bag during CY2018," said the survey report on 24 December. Meanwhile, the operating margins of cement makers could see some relief from the receding cost pressures. However, unless prices recover, growth in realisations, especially for south-focused cement companies, would remain muted.